Got an iPad? Well, that's all you'll need to set up Change. 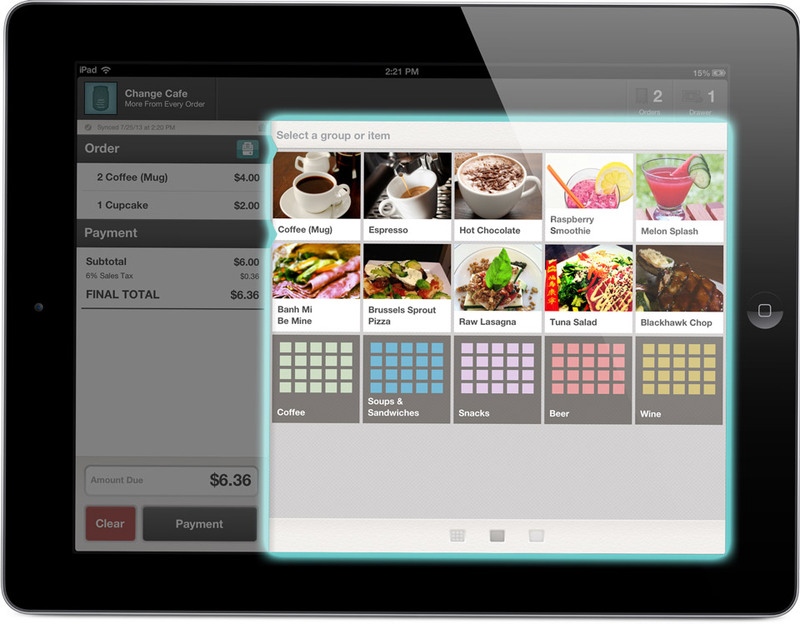 No need to spend hours hovering over a computer or cash register. Just grab your iPad, a cup of coffee, and before you can say "hot diggity," you'll be ready to roll. Entering all your items and menu can be a drag. We've designed our creation workflow for maximum speediness. Select a department, name your item, give it a price, select a color, and repeat. It's that easy. We're pretty sure departments will make your accountant happy. Not only will they help you track sales, but they make it easy to assign tax rates to different groups of items. You're the boss. This means you can lay out screens however you'd like. Want different screens for brunch, lunch, and happy hour? You can do that. Want to place a group of draft beers on your breakfast screen? We won't judge. Never get seasick while waiting for the screen to stop moving. Taking advantage of muscle memory, Change is designed for super quick navigation through tapping. The app never slows you down. Never get lost with the transaction journal. Order details are always on display and with just a quick swipe up or down, you can switch from ordering to payment in a snap. Easily keep track of payment types and amounts with four different payment labels and the discount tab. We also directly integrate with Dwolla. A customer's order isn't always cut and dry. We've made it so "I forgot my wallet" or "hold the onions" are no big deal. Our goal is to help your staff be confident and stress-free. Customize items and orders with modifiers and notes. Be it extra ingredients, special prep instructions, or a customer's name. Modifiers and notes are incredibly flexible. Pause an order with a single tap. To start a tab, add a note to the order, like a customer's name, to help keep you organized. Save paper by emailing receipts to customers. Change sends a happy little email to their inbox from you with a detailed receipt of their order. Data equals insight and we put it all at your fingertips. Make better decisions, strengthen your business, and stay ahead of the game. Access your online dashboard anywhere online to see currently synced stats and figures. You can even export session reports. Get an idea of how you're doing at any moment by printing or emailing reports directly from your iPad. To use Change, all you need is an iPad, but a receipt printer and cash drawer might also come in handy. Not sure what you need? Well, head on over to our hardware page for more info. Go ahead. Take us for a test drive. Looking for something specific? Check out our Feature Index for a complete list of our features.